The DAX index has posted considerable gains in the Thursday session, rebounding after losses on Wednesday. Currently, the DAX is at 12,503, up 0.69% on the day. On the release front, German Final CPI slipped to 0.1% in June, down from 0.5% a month earlier. Still, the reading matched the estimate. Eurozone Industrial Production rebounded with a strong gain of 1.3%, edging above the forecast of 1.2%. The ECB released the minutes of its June policy meeting. On Friday, Germany releases the Wholesale Price Index. Trade tensions between the U.S and its trading partners continue, keeping investors uneasy. Although the equality markets have reacted negatively to the trade tariffs, the overall impact on the markets has been muted. 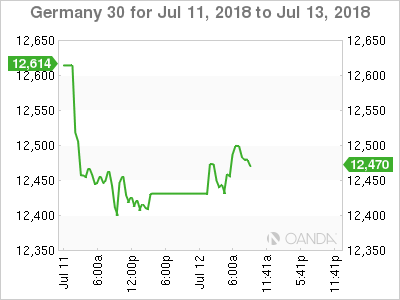 German markets, for example, have posted gains in July. The U.S and China imposed tariffs on each other of some $30 billion, the Trump administration has raised the ante, threatening to hit China with further tariffs on $200 billion worth of Chinese goods. China cannot retaliate in kind, since it does not import that amount of goods from the U.S. Still, the Chinese can take steps, such as making it more difficult for U.S companies to do business in China, or lowering the value of the Chinese yuan. With the ECB poised to wind up its asset-purchase program in September, attention is now focusing on the timing of a rate hike by the central bank. In June, the ECB said it would keep hold rates at current levels “through the summer” of 2019, but this wording is vague, leaving the precise timing open to debate. Does this phrase mean that that the ECB will wait until the October meeting, or could the ECB raise rates during the summer, if conditions warrant a hike? It would seem unlikely that policymakers will raise rates before the asset-purchase program is terminated, but the ECB has not shut the door on such a scenario. The ECB is forecasting that inflation will reach 1.7% in 2018, which is not far from its target of just below 2 percent. If oil prices were to surge and send inflation higher, there will be more pressure on policymakers to raise interest rates.